Two shelves in Wilfred Chen’s office are lined with “Star Wars” movie memorabilia. Not long ago, the protein engineering research that takes place in his laboratory could have been the subject of science fiction, too. 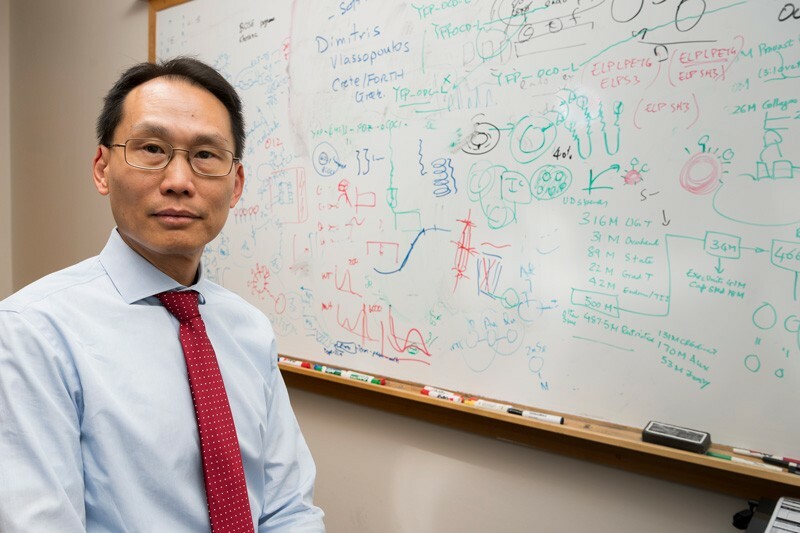 Chen, the Gore Professor of Chemical Engineering at the University of Delaware, develops technologies to modify proteins and DNAs in beneficial ways for applications that range from human health to sustainable energy. This includes novel uses of DNA computing and CRISPR Cas9, technologies of growing interest in synthetic biology. For example, Chen’s team has developed a technology to program strands of DNA into switches that turn proteins on and off — an innovation that could lead to the development of new cancer therapies and other drugs. In recognition of his contributions to the field, Chen will receive the 2018 American Institute of Chemical Engineers (AIChE) Food, Pharmaceutical and Bioengineering Division Award in Chemical Engineering at the 2018 AIChE Annual Meeting, to begin on Oct. 28, 2018. Chen has published more than 240 journal papers and delivered more than 90 invited lectures, and he has received many grant awards for his work, including two National Science Foundation grants that began this year. He will utilize a new $300,000 grant to develop a novel approach for degrading cellular proteins and a new $552,000 grant to develop a novel approach to redirect cellular metabolism using CRISPR/Cas9, a technology that has been gaining popularity for its use in genome editing. Synthetic biology is a growing area of scientific interest in the U.S. and a growing area at UD, said Chen. Another synthetic biology expert, Aditya Kunjapur, a post-doctoral associate at Harvard Medical School, will join UD’s chemical and biomolecular engineering department in January 2019. Chen joined UD in 2011 as the Gore Professor of Chemical Engineering. He was previously a Presidential Chair of Chemical Engineering at the University of California, Riverside. He earned his bachelor’s degree in chemical engineering at the University of California, Los Angeles, and his doctoral degree in chemical engineering from the California Institute of Technology. He also spent a year conducting post-doctoral research at the Institute of Biotechnology, ETH-Honggerberg, in Zurich, Switzerland. Terry Papoutsakis, the Unidel Eugene du Pont Chair of Chemical and Biomolecular Engineering, received the AIChE Food, Pharmaceutical and Bioengineering Division Award in Chemical Engineering in 1995.